I love listening to podcasts. Technology, storytelling, role-playing, news & current events, comedy & entertainment, politics, career interests, science are all topics covered in my podcast playlist. Before podcasts I listened to audiobooks frequently and the only problem I have with my podcast fascination is that it has displaced my audiobook consumption time. There are a few podcasts I regularly listen to that are related to my career. They cover developments happening in or related to the IT and the business of technology landscapes. It helps me triangulate what I read online, hear at conferences, and discuss with colleagues and customers. A fairly new podcast on this scene is The Hot Aisle and I highly recommend you check it out if you work in IT. The hosts interview a guest who is expertly familiar with the topic du jour – frequently the founder / maintainer of whatever technology or software project is being discussed – and they ask the questions to cut through the hype or confusion or misunderstanding and provide a good sense for the true value on offer. Seriously, subscribe to The Hot Aisle!! There is another podcast produced by folks from EMC that is more narrowly focused on something I have been working on for years and is what I came over to EMC to work on – Isilon NAS storage – called ClusterTalk. This monthly podcast has been going for just over a year and I have been in touch with the hosts first when I was an EMC customer and again since joining EMC late in 2015. I was interviewed about my experience running Isilon technology at Adobe and my new role as a Systems Engineer for EMC. It was a great experience and after the final edit they managed to make me sound like I knew what I was talking about. In May of this year I went to a storage vendor conference in Las Vegas called EMCWorld. I enjoyed some great technical content and was entertained at an Imagine Dragons concert. But I received some education while I was there that I hadn’t expected. EMC partnered with Charity: Water to add an altruistic and social responsibility element to this trade show. Specifically for EMCWorld, each participant that came to the Charity: Water booth and carried two 20 liter (5 gallon) Jerry cans would unlock a $5 donation by EMC as well as a matching $5 donation by Brocade to Charity: Water for their ongoing water projects. In total nearly 6,000 people participated unlocking donations by these companies which will be responsible for providing clean drinking water solutions for 6 villages in Ethiopia. What a simple act by nearly 50% of the attendees that resulted in so much good! I thought it was a nice gesture to include in this otherwise very narrowly focused event and I did my part to contribute and I thought I was pretty much done with the topic. On the last day, first thing in the morning, the organizer and CEO of Charity: Water was scheduled to give a presentation, I didn’t really go out of my way to make time to attend but I somehow ended up wandering in just as it got started. That presentation really cause a major shift in my thinking about this charity and, more importantly, about the issue of access to clean drinking water. This is getting long, so let me get to the heart of the matter of this post. I am convinced that this is an effort on which I can personally cause a material benefit. I am motivated to not only donate to help give someone easier access to clean drinking water, but to do what I can in my limited sphere to encourage others to donate and have a positive impact as well. I am asking for a birthday present this year. I am asking for you to join me and give a small amount of your resources to have a major impact on someone’s life, health, and well being. Help me reach and even smash my goal! $1,000 feels like a big number for someone without much of a track record of fundraising, but thanks to social media and the internet I can share the message with a large number of people and you can help me extend my reach. Please email, tweet, facebook, pintrest, etc… either this post or a link to my campaign at the Charity: Water website. I want to share an image that is an update to an image that is making the rounds on social media, email, and message boards. I usually consider images with quotes on them less than ideal as the content of the message is not searchable and you can’t highlight the text to copy and paste, it is just generally inefficient. All of that is true about this image below, but as it involves two quotes in apposition (juxtaposition involves opposite things, apposition involves similar things) the fact that it is an image serves to highlight the similarities between the two quotes. George A Smith believed non-racist ideas were not from God. Dallin Oaks believes the same about non-homophobic ideas. When I was young I loved riding ATV’s with my family but as I got a bit older I really wanted a dirtbike. When I was in my early teens I saw some ads for a Honda Cub 90cc 2-stroke automatic transmission dirtbike, and for a year or two I was convinced that it made perfect sense for my parents to buy me one. We had recently moved to the pacific northwest and basically lived in the middle of a giant swathe of old-growth forest with plenty of logging roads and other trails that I would explore with my neighborhood friends. For some reason, my dad was never able to see the obvious logic in buying me that or any other motorcycle. A couple of years later I remember riding my bicycle with a friend along a forest trail and encountering a younger boy trying to kick-start his dirtbike. I offered to start it for him if he let me ride a lap around a small BMX track (not much of a track, just a couple of banked corners a few whoop-dee-doos). He asked if I knew how to ride a dirtbike and I responded overly-confidently in the affirmative, worried that if he doubted my ability in the slightest he might not agree to the arrangement. Of course I had never been on a dirtbike, but it was a small bike with a small engine and I had spent countless hours on BMX & mountain bikes, plus with all my ATV experience I was confident that I understood how the mechanics worked (throttle, shifting, etc…) that I would figure it out quickly if I could convince him. It seemed like he had been quite frustrated by his inability to get the bike started so he agreed (wow, that really worked!?). I was almost over-sized for the small dirtbike so getting enough weight and muscle into the kick-starter wasn’t difficult. I immediately took off around the track, still fearful I would miss out on this opportunity to finally ride a dirtbike. I made a couple of quick laps, it was exactly as much fun as I always thought it would be, and returned the bike. As soon as I stepped off the bike and started for my mountain bike I had left on the ground I immediately regretted not negotiating more riding time. He was so desperate, surely I could’ve talked him into letting me ride for 10 or 15 minutes, what was I thinking!? When I got married I was able to convince my wife that a street-legal 150cc scooter was a good idea (and actually, it kind of was), and then eventually a 500cc sport bike. My desire for a dirtbike to tear up the trails never went away, though getting on two-wheeled power again for the first time in 10+ years certainly helped ease the longing. We didn’t have a garage to keep toys like a dirtbike, then I didn’t have a truck anymore so I couldn’t transport it if I did have one. Eventually we moved to a house and it had a garage and everything! Then one day at work some co-workers got to talking about dirtbikes and I found out that I had a local riding group ready to go, I was just missing the equipment. This weekend I took the first of what I expect to be many journeys on my two-wheeled off-road go-anywhere exploring machine. Aw yes! Here are some images and information about the final steps that have now been accomplished. 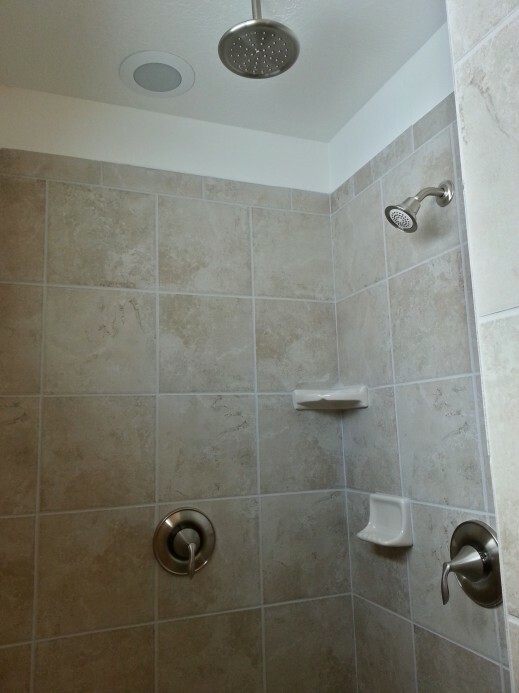 Here is an updated picture of the Master Bathroom walk-in shower, now with both shower heads installed. 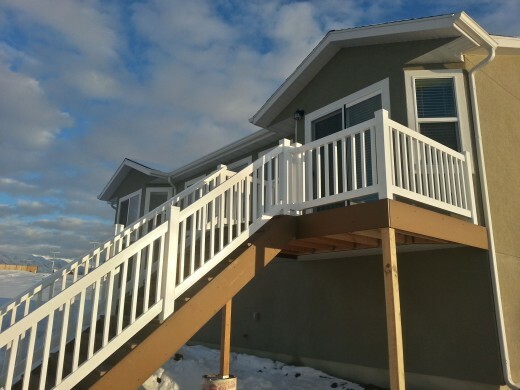 The back porch and stairs were installed and then the vinyl guy put up the railing. We opted for an extra section to be included up at the top to make a space for the grill. There is a natural gas outlet up there too so we can plug the grill into natural gas rather than dealing with propane tanks. 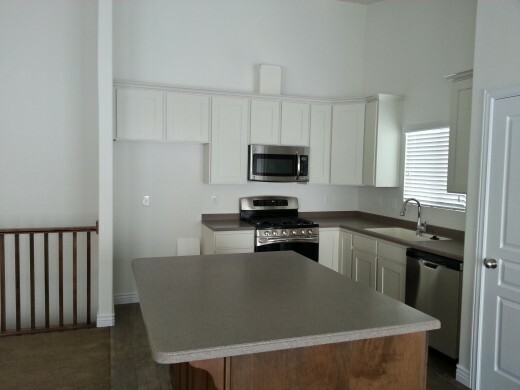 Here is a shot of the (basically) completed kitchen. The fridge has since been installed after this picture was taken. The cabinets over the fridge are the same depth as all of the other upper cabinets in the fridge. 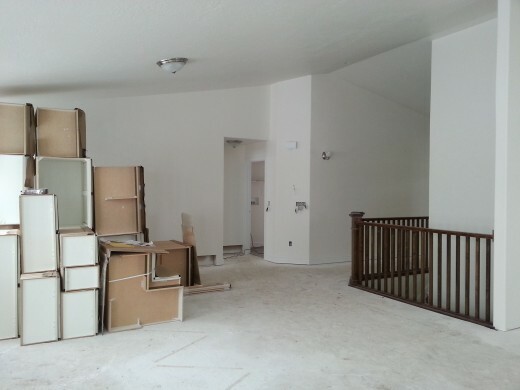 The builder is going to be replacing these with deeper cabinets like you typically find above a refrigerator. 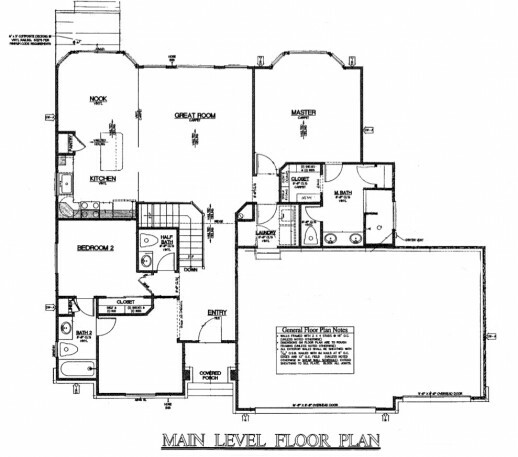 I meant to post a floor plan much earlier in these updates, but here is the main floor plan. 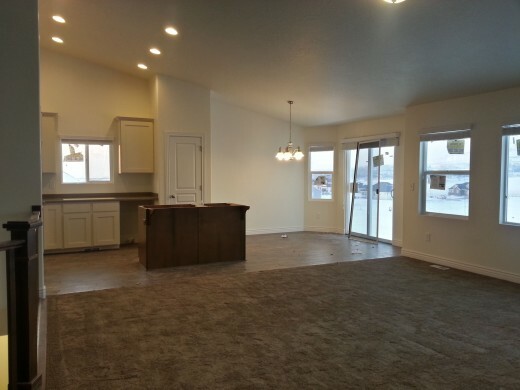 The carpet is in, counter tops are installed (except for the kitchen island), the sinks are in place, and most of the plumbing is complete. 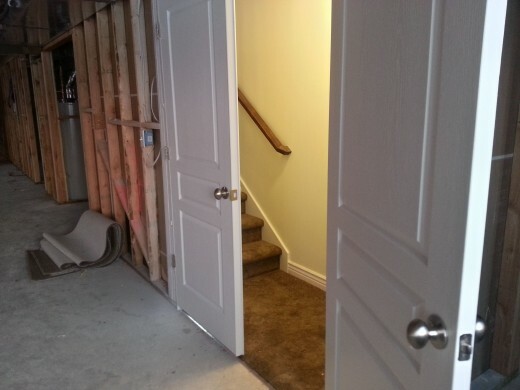 Down in the basement, I am very glad we were able to add a double-door at the bottom of the stairs. 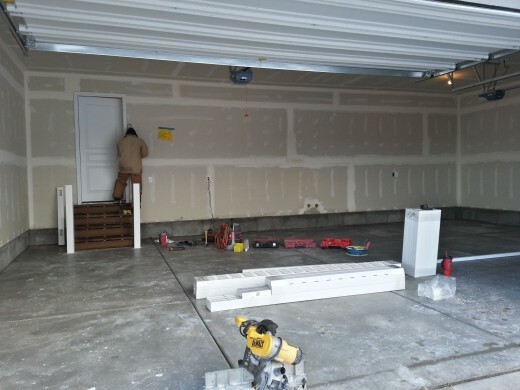 It will make getting large objects in and out of the basement much easier. Outside we have run into another delay that is almost certainly pushing out the completion – severe cold weather. It has been extremely cold in Utah ever since the first of the year. Most days the high temperature is only getting into the low 20′s and at night the low temperature is just a couple of degrees above 0. This is making pouring the concrete for the driveway, walkway, and back deck & stairs impossible. But, after a month of keeping a close eye on the forecast there looked to be a chance for some warming so the builders started getting ready. 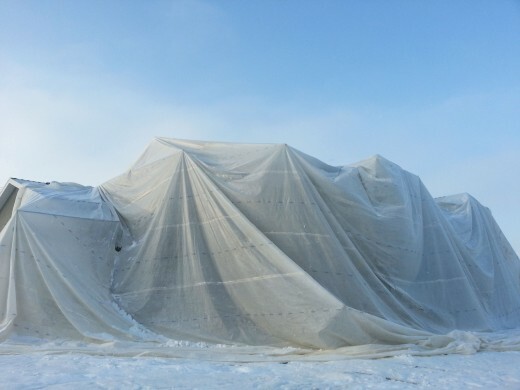 The frozen ground was dug up and then these large insulated tarps were laid down that have black on one side to absorb the heat and silver/grey on the other side to reflect any heat back into the ground. 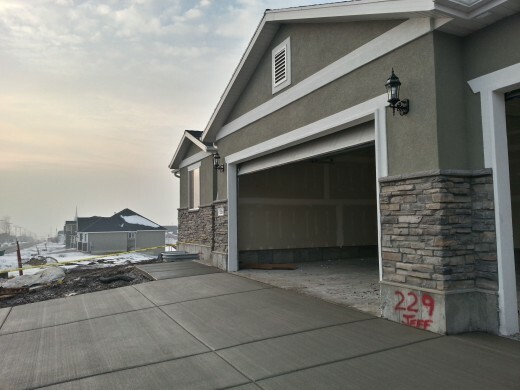 I thought that this was perhaps wishful thinking by the builder, but then one morning I went to work and I wasn’t shivering at all for the first time in a month. That day it got up to a balmy 38 degrees! This is a huge milestone and pretty much the last step that was being held up by the weather. However, there are still things that need to be done. The stone has been put up outside. 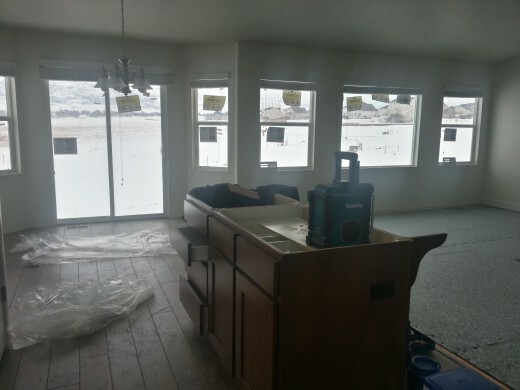 There is rather little left to do outside: the driveway, the deck & stairs in the back, paint the front door, and put the air conditioner in place. Inside it continues to look more and more like a house. The light fixtures are in place as are the closet hanger rods. The electrician is working on all of the outlets and switches. And then, nothing much happened for a while. We are getting to the phase of construction where individual steps do not take more than a day or two but a bunch of different specialties need to come in and do their work in a very particular order and there are supplies needed for each. So, if there is a delay in the availability of one installer or if the materials do not arrive to be installed then it can delay things. Then all at once much can change. The flooring guy arrived and the laminate in the kitchen was installed and the carpet went in soon after. 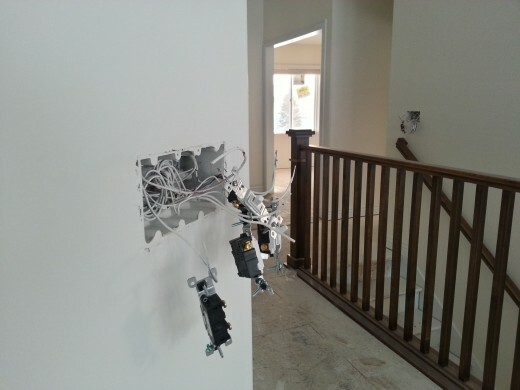 With the light fixtures in place and all of the outlets and switches wired up, the circuit breaker panel is filling up and the telecommunications box (on the right) has also been installed. 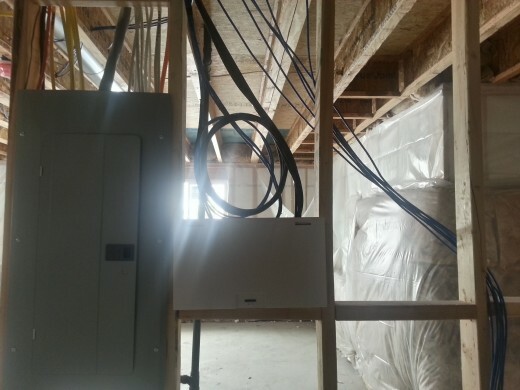 I am happy to see that my request for extra slack in the communication cabling (coax & network) has been honored, you can see the service loop of cable above the telecom box. The extra cable is good so that I have enough cable to relocate the telecom box a little should I need to. 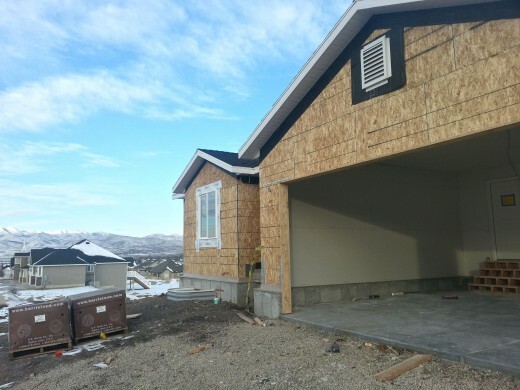 The build process has been relatively tolerable up to this point, but now that the house is reaching a nearly livable state the anxiousness to have it all done so we can move in is beginning to build. But there are still quite a few very small things that need to be done and/or fixed. Brrrrr, winter is really in full force now! 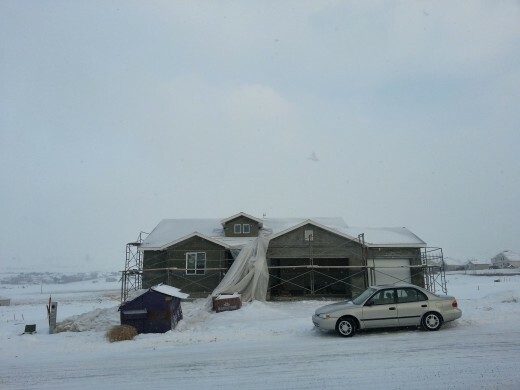 It must be brutal to be working outside in the elements to apply the stucco, but progress is continuing. We did receive a bit of unwelcome news during the Christmas break, the carpet we had selected had been discontinued so we would need to come into the showroom and select a new carpet but there were new choices as well. 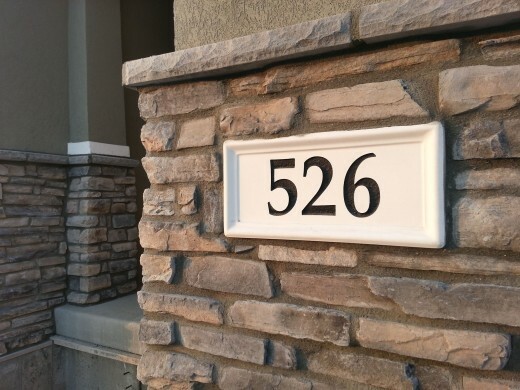 Also, our sales representative with Ivory Homes would be leaving the company and so we would be assigned a new rep to be our liaison with Ivory throughout the remainder of the process. We have been largely satisfied with the service we have received, hopefully nothing changes on that front. The cabinets throughout the house have now been installed. The tile work is all complete including the grout. I am really happy with the finished look. The tile does have a bit more brown & beige in it than we had anticipated, though it doesn’t ruin it for us it was not how we anticipated the look based on the tile sample in the showroom. The walk-in shower in the master bathroom is awesome! 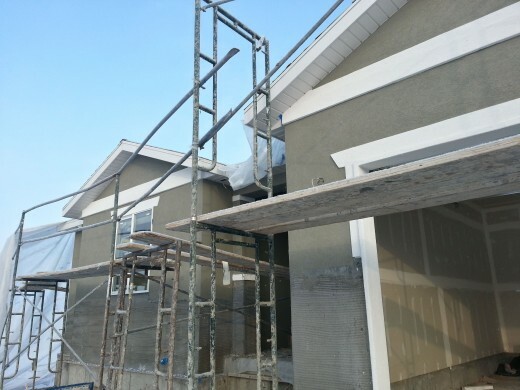 The finish stucco with color is being finished. I really like this view of the entire house covered in so much plastic. 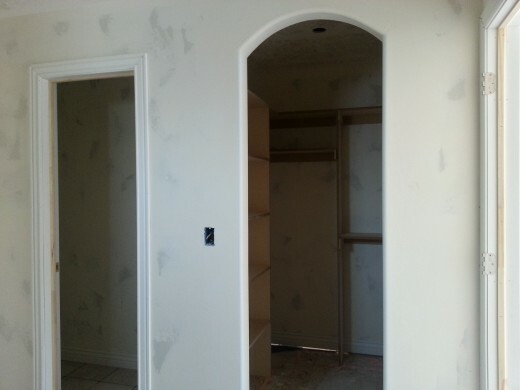 And here is a view of the final stucco finish. The area below will be stone. 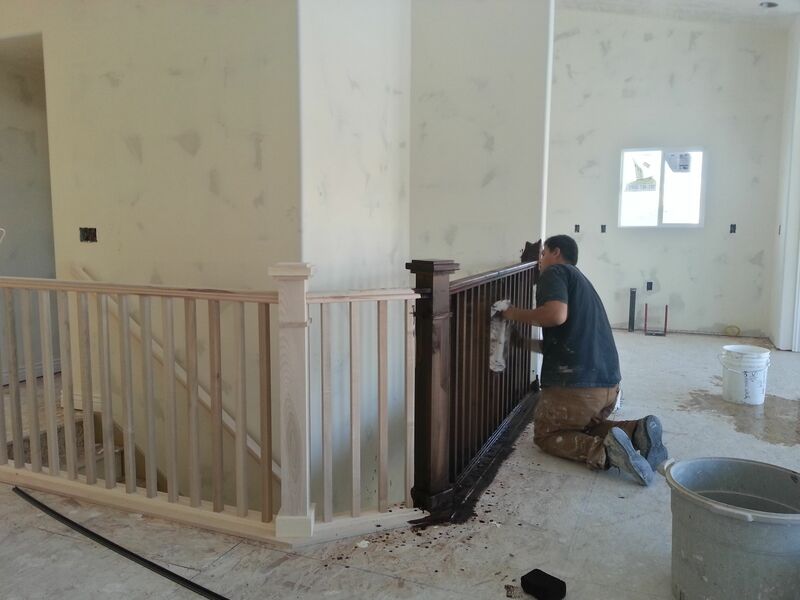 The bannister over the stairs down to the basement was installed. Immediately we were very pleased with the style we had chosen, but then the stain was applied and we were blown away by the look. 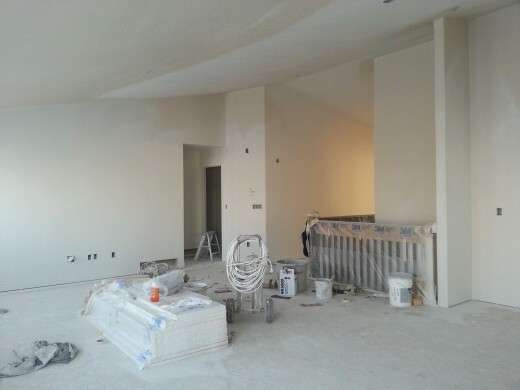 It is hard to really convey the progress of the interior painting as it comes across rather subtly in the pictures, the most noticeable aspect is how finished the interior of the house is beginning to look. Scaffolding has been setup outside in order to enable the exterior styling to be put up. After keeping a close eye on the house nearly daily up to this point, we are going to California for Christmas and it will be interesting to not see it for a bit and come back to find out how much has been done. The weather has turned and there is constant winter weather now, cold winds are now joined by cold rain and often snow. However, the house is now mostly sealed off and contained and the furnace is functioning. This means work inside the house has continued with significant developments. 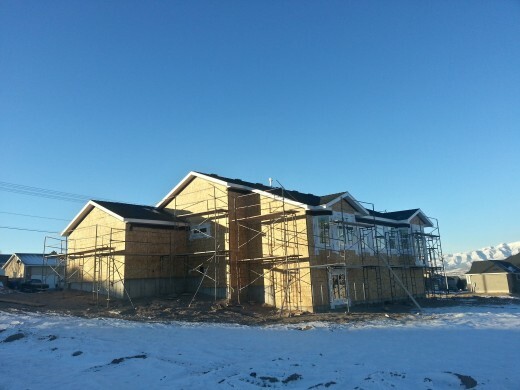 Now we just have to hope for adequate enough weather to allow for the exterior finish work to be accomplished. 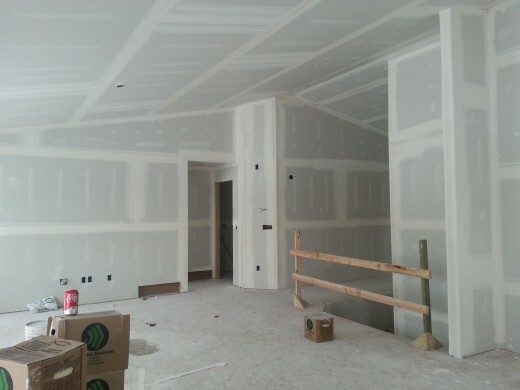 At the last update the framing, wiring, plumbing, and duct work were all complete. 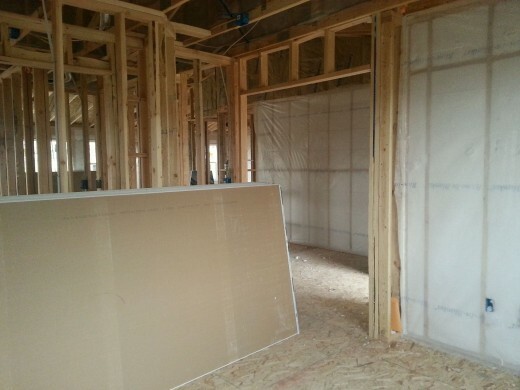 The next step is to insulate the walls and then put up the sheetrock. With the sheetrock up the superintendent who supervises the build comes and turns on the heater each morning so the workers can work comfortably. The first workers to benefit from the heater are the taping crew. Now you are starting to get a sense for the room spaces in the house. 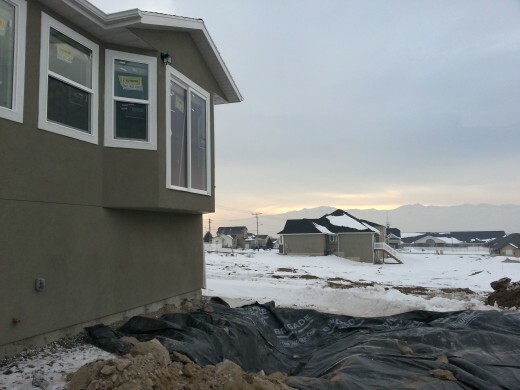 The stone for the lower-portion of the front of the house was delivered in big corrugated plastic boxes on pallets (the brown boxes in the lower-left). Also, the soffits have been installed and they look good. The wall & ceiling texturing was next. The wall texturing is subtle, the ceiling texture has a bit more relief. The tile guy started soon after the mudding was all complete. 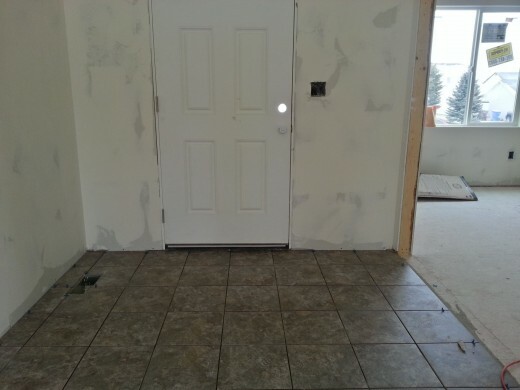 Below is a shot of the entryway with the dark tile we selected. The grout has not been put down yet. This is the first of the finish colors & styles to go in and where we can start seeing if the selections we made months ago actually go well together (hopefully yes!). That is where the progress stands today. 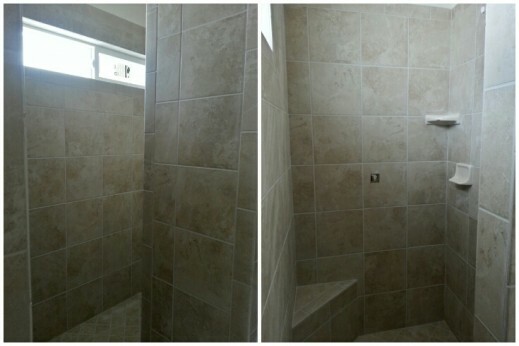 There is still some more tile to do, especially in the master bathroom wallk-in shower. 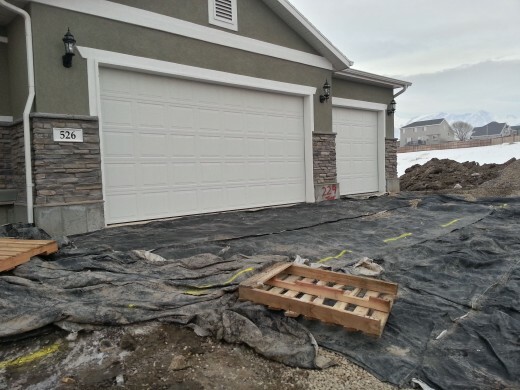 There is the exterior stone & stucco that I expect will go up as soon as the weather permits. Then I would suppose that interior painting will be coming up followed by the cabinetry.